Another Presidential assassination film from a few different points of view, Vantage Point is a deep, complicated story with characters that intertwine in a way that they reveal the full story as we move through the film. It provided The Movie Mind equal parts of frustration, suspense, and intrigue, while avoiding an overt political statement in a genre ripe with them. Whether you decide you love or hate this film, it is undoubtedly worth your time. Just be sure your attention is not diverted elsewhere or you will miss much of the depth that makes the film an entertaining journey at the very basis of the argument. 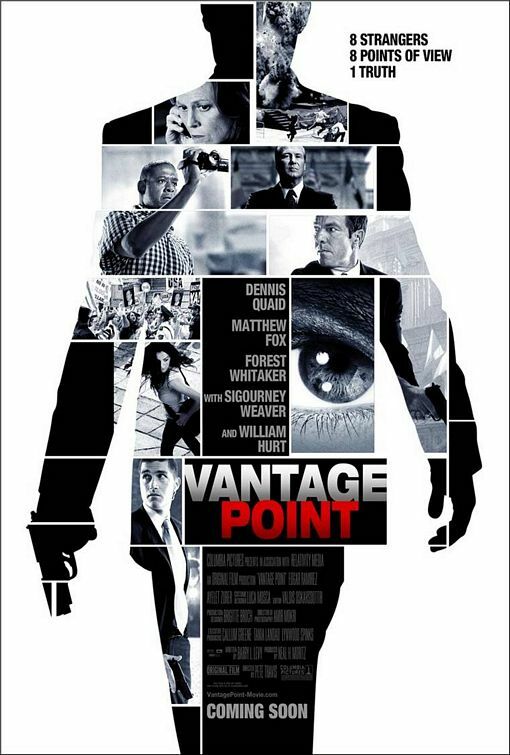 Vantage Point chronicles an assassination attempt and subsequent terrorist attack from the point of view of a couple different key players in the story. Part of what is frustrating also is what makes the film entertaining, in that each time the same piece of the story is told, another layer is revealed. We are slowly provided clues as to each character’s involvement in the overall event. After about the third or fourth go-round of the same 10 minutes it begins to seem like too much repetition, but instead this is where the film produces. One way to create some additional suspense is to watch closely at the very minute details, as this film’s attention to the smallest pieces of the story is what creates the amazing suspense. I do think there are a bunch of clichés and typical government conspiracies as tends to be the norm in this genre, but the method in which the story is delivered clouds those shortcomings. Just for the record, I realize this method of storytelling was not invented by Vantage Point (aka Reservoir Dogs, Snake Eyes, etc. ), but it is original in the context of a big budget action/thriller. I do realize I have to temper my reaction to this film since I would declare anything about the Secret Service a masterpiece, but it was still done in a unique, suspenseful manner. Dennis Quaid is Agent Thomas Barnes, fresh off taking a bullet for the President and saving his life (it was all of 6 months ago). His partner, Kent Taylor (Matthew Fox), has lobbied for him to get back in the saddle and managed to get him on this detail in Spain. The rest of the characters all help to support the plot, but it is between these two that the true story lies. Even while this can be considered an action and suspense film, it is also about as much a character portrait as you are going to get with these surroundings. The film is worthy of a viewing, and if it piques your interest, I would recommend watching it another one or two times. I think that so much more of the story will come together as you watch it with a different understanding. Now maybe that means the picture wasn’t painted clearly enough the first time, but either way it should be interesting to see how much more you notice. While Quaid is the “everyman” that made him into the default option for the older, underdog, sympathetic leading man, Matthew Fox may have been a big miscasting. I believed him originally, but as the story goes on it becomes less feasible that he is what they make him out to be. Forest Whitaker comes through again with an overly dramatic hound dog-sappy face, but the guy can act (even if sometimes it is overacting). There are some other nice breakthrough roles from foreign actors that should be nice to see in the future. All in all, if you are looking for a different experience from a movie, Vantage Point provides that. Interesting Cameo Appearance: Holt McCallany (aka Detective John Hagen, former love interest of Calleigh Duquesne, on CSI: Miami) as Agent Ron Matthews, a Secret Service agent guarding the President during the bombing, and surprisingly, the actor from CSI: Miami with the most success on the big screen (sorry David Carruso). Phil McCullough: Sir, we have to act strong. President Ashton: No, we have to BE strong. Holden: What are the chances he freaks out in the middle of a walk? Thomas Barnes: I’d put it at 50/50. Thomas Barnes: For getting me back out here. Kent Taylor: Don’t thank me yet. Enrique: We have to go! You’re all in danger! We have to go! Thomas Barnes: Control is compromised! Angie Jones: The President of the United States has been shot. Ah man, dude, you are insane if you think this was better than “The Kingdom”, because that movie kicked all kinds of @$$. “Vantage Point” was alright, but it was nowhere near as intense as “The Kingdom”.